Bikini Event at Eco-tastic Clothes and Living! Join us tomorrow evening, Friday March 5th, for a "Spring Break Prep Party" at Eco-tastic Clothes and Living on Arlington Ave! 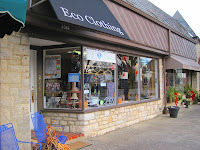 Eco-tastic is the exclusive Columbus retailer for my Reclaimed Cotton bikini line. Each bikini is one-of-a-kind and will not be repeated. Eco-tastic will carry a small collection while supplies last, as the rest are going to New York, Chicago, and possibly Evergreen and Virginia Beach. Lately, everyone has been asking me why I am focused solely of bikinis made of cotton, and what has inspired me to do so.. In the late 20’s through the late 50’s, most swimsuits were made of cotton. Cotton is a durable, breathable, natural, biodegradable, and a renewable resource. Most of the swimwear manufactured today is made of synthetic fibers, which may dry a little faster, but does much more harm to our planet. Cotton bikinis provide a simple, beautiful, back-to-basics solution to natural swimwear. Reclaimed Cotton Bikinis are made with recycled cotton fabric. I take worn-in tee shirts made of cotton jersey and repurpose the fiber to create a string bikini form. Each bikini is handmade by the artist. 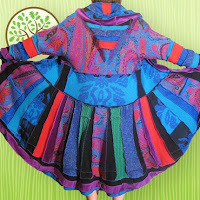 Changes in color and design through the material used make each piece completely unique. This ensures the wearer that her swimwear is the only one of its kind. By using cotton, I am promoting the use of natural, earth-friendly materials. By using recycled material, I am helping to reduce the carbon footprints of a generation; turning one’s trash into another’s beautiful, wearable, eco-conscious art. I was pretty proud of my recycling skills..
Until New York fashion week.. This dress by designer Emma Kaywin is made completely out of expired condoms. Wow. It's hard to think about autumn already when it's not even spring, but my dance card is beginning to fill up. 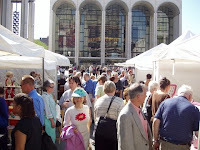 I have a show in my town here in UA and one in a beuatiful old estate in New York. Hooray. I will be featured in two shows this fall.. I think it's very important to pay hommage to other visual artists out there that are making beautiful and interesting things, so I've decided to share some of my favorites with you from time to time. Also, it's snowy outside, and I need a break from my work, so here are a three of my favorites, for your enjoyment. 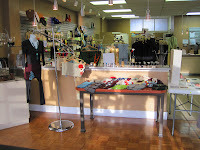 My first small collection of spats and minis are now available at Ecotastic Clothing and Home in Upper Arlington! 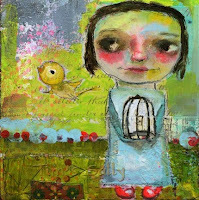 I am very excited to be included in the group of talented artists featured in this awesome, Earth-friendly store. You can find so many beautiful things in there~ reuseable shopping bags handwoven out of recycled plastic, organic cotton and bamboo yogawear, natural babygear.. It's a eco-fashionista's paradise. I am currently working on a large collection of my Reclaimed Cotton Jersey Bikinis for our opening bikini reception, March 5th from 6-9, which will be an awesome prelude to the impending Spring Break 2010. More info about the reception to follow soon. Shop Local, Handmade, and Green! PS.. I had a WONDERFUL 26th birthday on Friday, dinner and wine in the Short North with my husband and love and kisses from my boys.. what more can a girl ask for? Welcome to New York.. the place that dreams are made of.. there's nothing you can't do..
Five-ish years ago I fell in love with two things and I only got to keep one of them. The boy I loved became my husband but New York City, my other love, became "the one that got away...."
I spent the summer of 2006 working in the city, for a city-famous stylist Alexia Kondylis. I worked with a group of beautiful, talented people, saw great things, fell deeper into my romance with my "second love," the city. I was also in my third trimester of pregnancy with a little baby, Henry. At the end of a beautiful summer, I left my city behind and went home again to quaint Ohio, to raise my little darling in the safety of the suburbs. In the years that have passed I've dreamed of my city love, missed it, cursed myself for letting it get away. I traded dreams of one kind for dreams of another. I have two beautiful little ones and no big city at all. My little ones are the loveliest things I could ever ask for, but I left a piece of my heart, and my dreams, back there. I promised myself at age 43 (the year Jonas graduates high school) I'll move back to the city and enjoy a vibrant second youth and breathe in the energy every day, but for now, here I am.